Out of all the different types of fruits available, some of my favourites are the berries – all types – strawberries, blueberries, blackberries, mulberries, cranberries, goji berries, acai berries, and my all time number one out of all of them – raspberries. Berries are a great choice for those who don’t do well on fruits with high amounts of sugars, they are some of the most gentle foods on the digestive system, supporting and feeding our colonies of good bacteria without overloading it with excess sugars. Even though all of these berries have much in common – being high in antioxidants, silica for healthy skin, hair and nails, B vitamins, iron and magnesium – each type of berry has it’s own unique nutrient profile that offers healing properties for certain conditions. For example, cranberries are a tonic for the urinary system, whereas blueberries may reduce the risk of certain cancers and goji berries are associated with longevity. 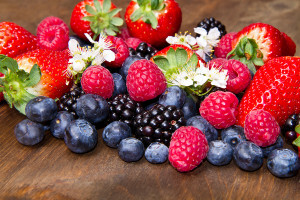 Berries can help to heal varied health problems such as inflammation, cardiovascular disease, gout, diabetes, cancer, and they can also help improve eyesight and cognitive function, as well as being cleansing and alkalising. Each berry has a specific affinity for a system of the body and has it’s own set of phytonutrients which are recognised at a cellular level. Which means that we need to eat a variety of berries every day and not just one type! What a shame! Half a cup a day is recommended to gain maximum nutrient and antioxidant value – but I will often enjoy more than that. 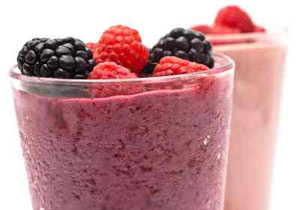 Blend and enjoy, it’s berrylicious! Wow, I loved this recipe, I made it on the weekend and it was divine! It made a lot though, so I shared it wiht my family and they really enjoyed it too. What a great way to get some heathy fuits and greens into my kids. Berries are my favourite but I don’t usually get fresh, just frozen. Hope that still counts! Previous post: Crazy Product Sale! Big Discounts! Next post: Do What You Will Do!